La Terrasse des Epices, Souk Charifia Sidi Abdellaziz, Marrakech, Morocco. +212 5 24 37 59 04 Good views of the city from the terrace. Kosybar, top floor, 47 Place des Ferblantiers, Marrakech 40000. 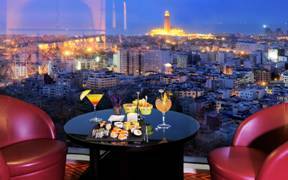 +212 524 380 324 For a superb rooftop view across the city out towards the Djemaa el-Fna and a laid-back drink. At night, the bar hosts live music within its beautifully styled three floors. Essaouira Hotel, 3 Derb Sidi Bouloukat, Marrakesh. +212 524 443 805 Rooftop cafe. 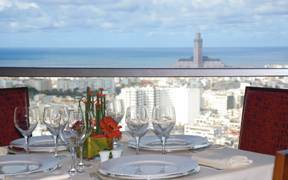 Le Sky Bar, Villa Blanca Hotel, Boulevard de la Corniche, Corniche Ain Diab, Casablanca 20050. +212 5 2239 2510. Noisy if you're a hotel guest. The Pergola, rooftop, Rick's Cafe, 248 Boulevard Sour Jdid. Place du jardin public, Ancienne médina, Casablanca, Morocco. +212 522 27 42 07/08. Above Rick's (from the movie Casablanca with Humphrey Bogart 1942). Rooftop restaurant which serves Cuban cuisine. 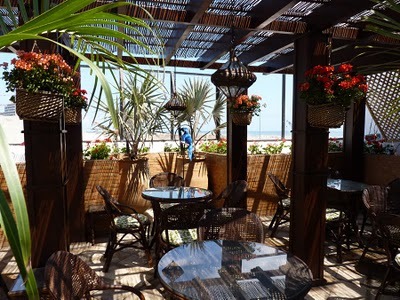 Open for the summer months, this stylish bar overlooks the sea and has comfortable rattan furniture, baskets of flowers, sea breezes and, of course, blue parrots. Dar El Hana Guesthouse, 22 Ferrane Kouicha, Talaa K'Bira, Fes 30200. Morocco Rooftop terrace feasting with views across the medina and its minarets, can be all aglow courtesy of Ramadan. Rooftop cafe, Nejjarine Museum, Fez, Morocco. Restaurant Massinissa, Rue du Marche, Ouarzazate, Morocco 45000. +212 52 488 4646 It has a pleasant rooftop terrace. You can overlook the whole center of Ouarzazate including the pedestrian zone. If you are lucky you can catch a fresh breeze on the rooftop while having dinner.